Although Fred was not really interested in racing, the powerful 40 h.p. 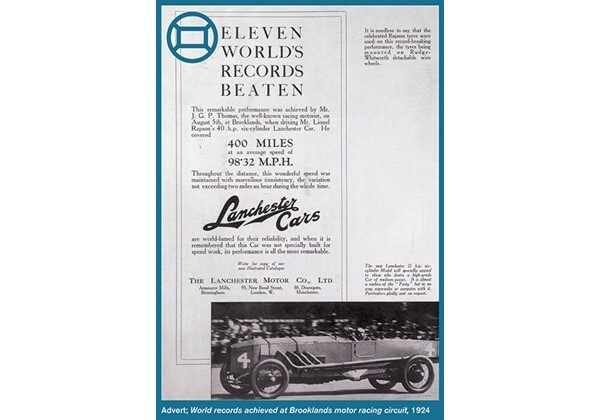 chassis of the 1920s led several individuals to use the cars for records attempts, especially at the iconic Brooklands racing circuit. Cars with a large 6.2 litre engine, streamlined, lightweight bodywork and names like ‘Hoieh-Wayaryah-Gointoo’, ‘Softly-Catch-Monkey’ and ‘Winni-Prap-Praps’ (because of the noise its engine made) were high profile celebrities of the time, racing against the likes of Malcolm Campbell. Just 30 years after the first ever cars were produced, these amazing machines were able to average around 100mph over many hundreds of miles, testing components like high-speed tyres to their limits.